Before attempting this quiche, I thought needed spinach or baby kale. But then I realized that St. Patrick’s Day is coming up soon. Why not use cabbage? It’s often on sale this time of year, and I had some Napa cabbage sitting in my crisper drawer already. For added colour, I tossed in some shredded Romaine. The point is that you can use whatever greens you have at home or can easily get. Keep things simple and delicious. That’s my goal. And the first bite confirmed that this recipe is a keeper. Not only are the greens flexible, you can add various salted meat options if you wish. Bacon, corned beef, ham, and sausage are all on my list to try in this recipe. This time I went vegetarian, incorporating the mushrooms I had, and was not disappointed. They were marvelous. Even though I don’t have to cook everything dairy free anymore, I did not feel a need to add cheese to this recipe. 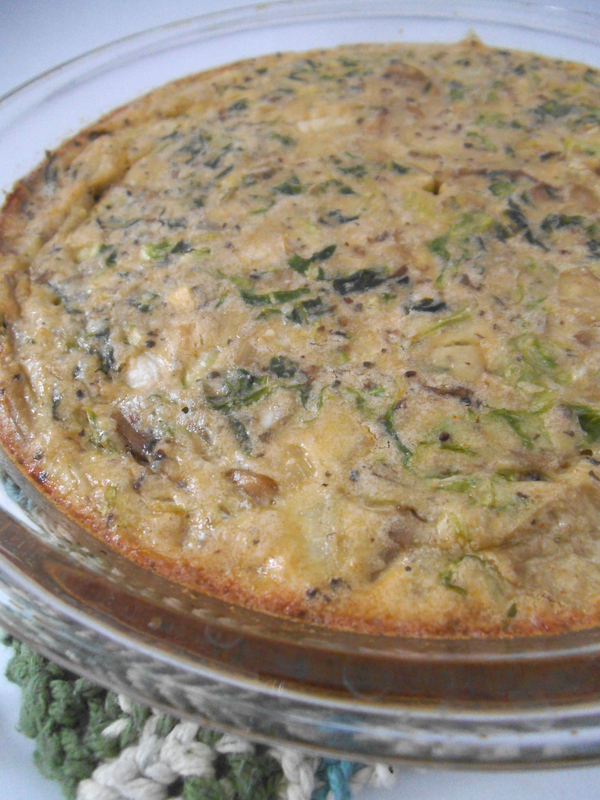 I wanted to taste how the artichokes, greens, and eggs blended together without interference. The result proves that dairy is not a requirement for a quiche. Nor is it essential for breakfast casseroles, as demonstrated by my recipes for egg casseroles with grits and rice. Apart from smothering everything in cheese, there is another way. And it’s well worth continuing–and savouring. Especially if artichokes are involved. 1 1/2 cups sliced greens, such as cabbage, Romaine, spinach, baby kale, chard, etc. Preheat oven to 350 degrees F. Saute white onion with oil or butter in a medium pan until onions are tender and golden. Add mushrooms (if using) and garlic and saute for 2 minutes. Add basil, paprika, and greens saute greens until wilted. Remove pan from heat and allow the contents to cool. In a medium bowl, whisk together mayonnaise, garlic salt, and worcestershire sauce. Add beaten eggs and whisk to blend. Stir in artichokes and almond meal, along with prepared greens, mushrooms, and onions. Pour egg mixture into a greased round baking dish. Gently stir to evenly distribute ingredients. Top with parsley. Bake at 350 F degrees for 30 minutes or until eggs are just set in the middle. Great combo of greens! 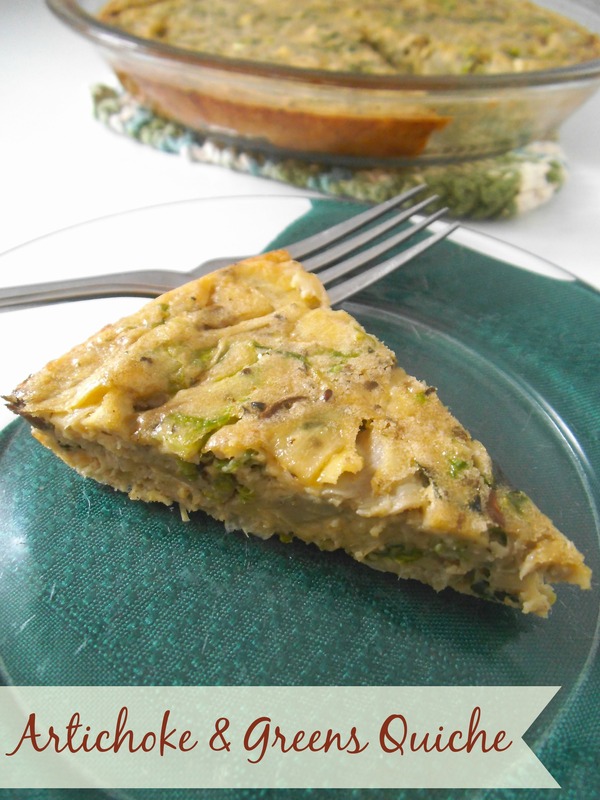 Never thought of artichokes in quiche, I be it’s really good! It’s interesting what can happen within the constraints of using what’s on hand. I also recommend trying a slice with marinara sauce. That really put it over the top! Thanks! I really enjoyed it, and I think you would too. Looks great! We’re planning on making a green veg tart this week, think some cheese will be sneaking its way in though… LOVE artichokes! Thanks. Cheese is something I’ve always loved, and I’m glad I can enjoy it again. I think this quiche would taste great either way. And I discovered today that it is fabulous topped with a bit of marinara sauce! I wasn’t sure how the Romaine would work, but it blended in well. Will give this a whirl. 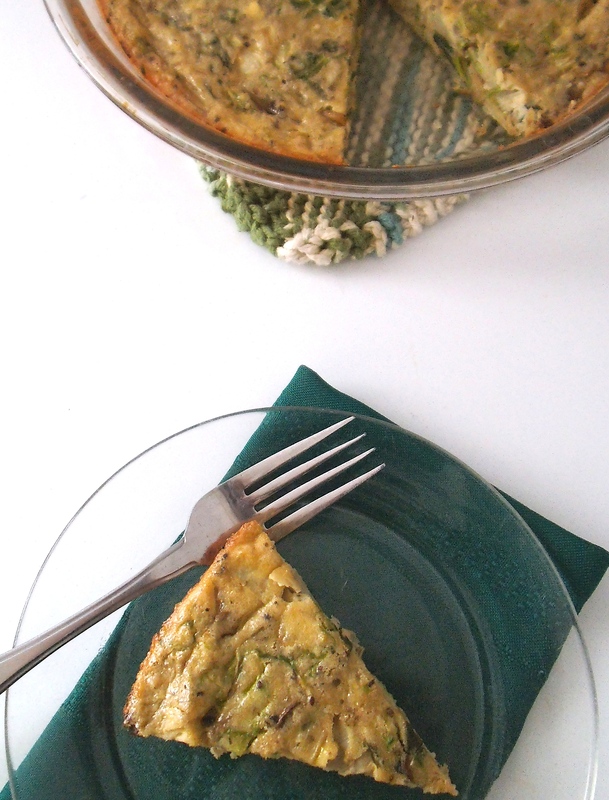 Love a vego, gluten-free and dairy-free quiche!